Our kinders are working on setting up experiments to test their predictions...so here is there little ditty...to the song High Ho The Dairy-O. A prediction is a guess, a prediction is a guess...high ho the dairy-o A prediction is a guess. They LOVED it. We predicted where our car would land on a yardstick. Our partner marked the spot and we tried to "push" the car to the spot. 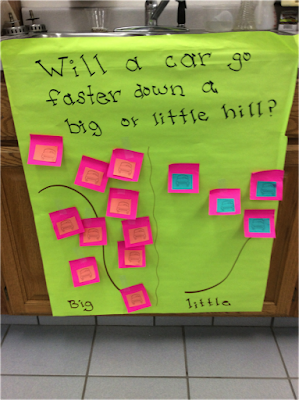 Then we predicted if a big hill would make our car go faster. We marked our graph with a sticky tab, then I demonstrated big hills and small hills. We saw the outcome. Then...the kinder kiddos got to set up the same experiment. The finished with a race between the partners...predict who will go farther...Science is FUN! Predicting where the car will be pushed reinforces number recognition! Reviewing push and pull through experimentation! A big hill makes our cars go farther!!!! I use the sheets for the kiddos from my Force and Motion Pack!